Love Metals? Good For You! There is an interesting opinion that I have read on the web that it wasn’t Trump who put the metals on the rise as many people think, it could be the Chinese huge economic stimulus instead, as shown in the chart below. I decided to make my own analysis of the price dynamics to check this assumption. Chart 2. 1-Year Comparative Chart of ETFs and Metals: Synergy Wins! In the chart above, I have combined three ETFs and three metals for clear illustrations of two important things - the first thing is timing and the second thing is the result of the instrument choices. Posted in INO.com ContributorsTagged aibek burabayev Cold Rolled Steel Gold (FOREX:XAUUSDO) iShares MSCI Global Metals & Mining Producers ETF (NYSE:PICK) Market Vectors Junior Gold Miners ETF (PACF:GDXJ) Silver (FOREX:XAGUSDO) SPDR S&P Metals and Mining ETF (PACF:XME)1 Comment on Love Metals? Good For You! The Fed is completely chickening out from raising rates and all related markets are on the move. 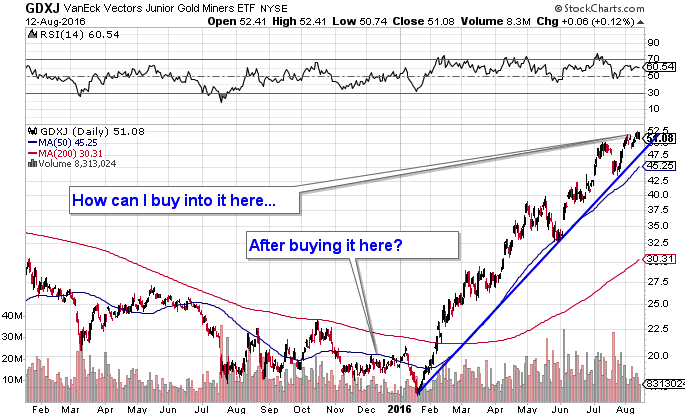 Let's dive into our options trade on the gold miners and show you where I think we're headed next.